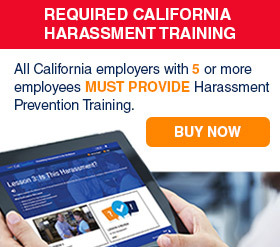 Compliance Alert: Due to increased minimum wage and meal and lodging rates effective January 1, 2019, a new posting is required for this California Wage Order. Note: The Spanish poster is on preorder pending the release of the updated Wage Order 14 by the DIR. CalChamber’s laminated 27.5” x 25.5” English poster and 27.5” x 23” Spanish poster each combines the multiple pages of Wage Order 14 into one convenient poster. These posters are recyclable. Wage Order 14 regulates wages, hours and working conditions in Agricultural Occupations. Wage Order 14 covers agricultural occupations related to the maintenance of soil, buildings and machinery that constitute the basic farm facilities and to the cultivation and handling of farm commodities up through harvest, including field packing and transportation to the place of first processing or distribution. Employees in these occupations can work for the grower, for a farm labor contractor or for an organization providing agricultural services. Wage Order 14 covers agricultural occupations related to the maintenance of soil, buildings and machinery that constitute the basic farm facilities and to the cultivation and handling of farm commodities up through harvest, including field packing and transportation to the place of first processing or distribution. 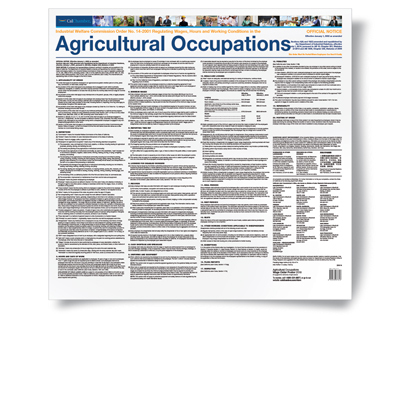 Employees in these occupations may work for the grower, for a farm labor contractor or for a company providing agricultural services. Wage Order 14 does not cover all farm employees. If the grower has a packing or processing operation under Wage Order 8 or Wage Order 13, which are industry orders that cover handling operations after harvest, all of the support personnel on the farm and the packing house workers would fall under the industry order. These include clerical employees and drivers, for example. If there is not a Wage Order 8 or Wage Order 13 operation, the white collar workers would usually fall under Wage Order 4, but there are other possibilities. For example, if a grower operates a produce store or retail nursery substantial and distinct enough to constitute a separate mercantile business, Wage Order 7 would cover all of the employees connected with it in any way. Although farm employers do often engage in various enterprises, the Division of Labor Standards Enforcement suggests that you should make every effort to limit the number of applicable Wage Orders to two, if possible—either the two occupation Wage Orders, 14 and 4, or Wage Order 14 and the industry order that best reflects the main purpose of your nonfarm operations. Organizations providing commercial agricultural services employ some individuals who work on farms in agricultural occupations who fall under Wage Order 14, such as tractor drivers, etc. If the organization is in the business of selling chemicals, irrigation systems, etc., its other employees fall under Wage Order 7, Mercantile Industry. However, some organizations only contract to provide the service, so their support employees fall under Wage Order 4, Professional, Technical, Clerical, Mechanical and Similar Occupations.